While science works to unscramble dietary cholesterol’s relation to heart disease, experts reveal eggs’ benefits and suggest ways to incorporate these protein-rich foods. When I was growing up, eggs showed up regularly on the dinner table—not the fried kind you’d find paired with bacon or sausage but fluffy frittatas sautéed with crisp potatoes, bright green asparagus, or sweet red or green peppers. Simple, nutritious, and inexpensive, these dishes were my childhood favorites. So you can imagine my surprise when just a few years later in my college nutrition classes I learned that eggs were no longer as healthful as I thought. Some experts even recommended avoiding them altogether due to their high cholesterol content. Over the years, the restrictions on eggs have loosened, so much so that the 2006 American Heart Association (AHA) report doesn’t even mention them in its guidelines. But despite this exoneration, eggs’ unhealthful reputation has been hard to shake and confusion abounds. “People are still afraid of eating eggs. I get questions about it all the time,” says Katherine Tallmadge, MA, RD, an American Dietetic Association spokesperson who has a private practice in Washington, D.C.
And, lest we forget, eggs are made up of more than just cholesterol. They also contain high-quality protein and are an excellent source of many essential nutrients. Also, eggs are inexpensive, easily accessible, and palatable to most consumers, all important factors to consider when counseling clients. Despite this fact, research on dietary cholesterol’s effect on heart disease has not been clear cut, which is why the 2006 AHA guidelines still recommend 300 mg or less cholesterol per day for healthy individuals and 200 mg or less per day for those with a high risk of developing heart-related issues. In fact, few epidemiological studies have found a connection between eating eggs and increases in heart disease risk. A 2000 clinical review of cholesterol feeding studies by McNamara published in the Journal of the American College of Nutrition found that total blood cholesterol dropped only 2.2 mg/dL for every 100 mg decrease in dietary cholesterol. Based on this analysis, the 27% drop in per capita egg consumption from 1965 to 1995 would account for only 3% of the 30 mg/dL fall in population cholesterol levels during this time. One of the largest egg studies, conducted by Hu and published in The Journal of the American Medical Association in 1999, examined data from the Health Professionals Follow-Up Study and the Nurses’ Health Study. Known as the Harvard Egg Study, it reviewed dietary questionnaires from 37,851 men and 80,082 women. Results revealed no overall association between egg consumption and risk of coronary heart disease or stroke in normal, healthy men and women, even at the highest level of intake of one egg per day, amounting to seven eggs per week. In the United States, cholesterol intakes have dropped drastically since 1970. Today they average only about 278 mg/day, and egg consumption has fallen as well. According to 2005 USDA food supply data, eggs provide only about 35% of the cholesterol in the U.S. diet; the lion’s share, nearly 60%, comes from meat, fish, poultry, and dairy. “It will be interesting to see how the National Cholesterol Education Program and the new Dietary Guidelines deal with cholesterol,” says Lichtenstein, referring to the recommendations scheduled for release sometime this year. Part of the reason why the relationship between heart disease and eggs remains so elusive has to do with the wide range of individual variability researchers see in response to dietary cholesterol. Age doesn’t appear to be an issue, either. While many older people shy away from eggs for fear of raising their cholesterol, they may be worrying unnecessarily. A 2006 University of Connecticut study published in Nutrition & Metabolism showed that eating three eggs per day for 30 days did not raise heart disease risk in healthy older adult men and women. The main reason: Even if there was a slight raise in LDL cholesterol, it was always accompanied by a similar rise in HDL cholesterol. Thus, eggs may be an inexpensive, easy, and nutritious way to increase protein in this population. For people with diabetes, however, the story may be different. In the Hu study, men with diabetes on the high-egg diet had a heightened risk for cardiovascular disease. A February 2009 study by Djoussé published in Diabetes Care that reviewed dietary questionnaires from the Physician’s Health Study reported daily egg consumption was associated with an increased risk of type 2 diabetes. Another reason could lie in the disease itself. Since people with diabetes typically have faulty fat metabolism, perhaps they are unable to process eggs the same way healthy adults can. In any case, Greenblum concedes the relationship between eggs and diabetes is an area that deserves more research. But what if your client is concerned about cholesterol or even has high cholesterol and his or her diet is not so healthful? You also want to monitor egg consumption, along with all fat consumption, if your client has diabetes or any other contraindicated health condition. To give your clients healthful ideas on how to eat eggs without pairing them with fatty, high-calorie ingredients, take your cue from ethnic dishes. Suggest stir-fries using scrambled egg and whole grain combinations such as fried rice with brown rice or soba noodles. Serve a poached egg nested on a bed of swiftly sautéed spinach or a variety of other cooked greens like many Europeans do, or smother eggs with vegetables such as zucchini, asparagus, potatoes, and onions. Instead of sausage or bacon, opt for a fruit salad. Finally, look to Latin American and Middle Eastern cultures, where you’ll frequently find eggs married with cooked beans such as spicy pinto beans or black beans. When it comes to eggs, the culinary possibilities really are endless. — Diane Welland, MS, RD, is a dietitian and freelance writer based in Springfield, Va. While cholesterol may be the most scientifically studied nutrient in eggs, it certainly isn’t the only one of importance. Eggs are well-known for their high-quality protein, which is highly digestible, concentrated—one large egg contains 6 g—and perfectly balanced with the right amount of amino acids for human growth and development. And although most of the protein is located in the white (3.6 g), a considerable amount (2.7 g) is in the yolk. 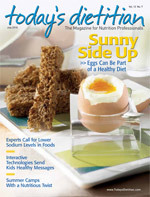 Consuming high-protein foods such as eggs is particularly important for older adults because it can help stave off muscle loss and reduce the rate of protein breakdown.1,2 The fact that eggs are inexpensive and low in calories is another bonus, making them a popular choice for budget-conscious consumers and families with children. 1. Celentano JC. Nutrition review: Where do eggs fit in a heart-healthy diet? Am J Lifestyle Med. 2009;3(4):274-278. 2. Herron KL, Fernandez ML. Are the current dietary guidelines regarding egg consumption appropriate? J Nutr. 2004;134:187-190. 3. Webb D. Dietary cholesterol, eggs and CHD. Unpublished paper for the Egg Nutrition Center. February 2010. 4. Beyer RS, Jensen LS. Overestimation of the cholesterol content of eggs. J Agric Food Chem. 1989:37(4):917-920. 5. Kritchevsky SB. A review of scientific research and recommendations regarding eggs. J Am Coll Nutr. 2004;23(6):596S-600S. 6. Klein CJ (ed). The Scientific Evidence and Approach Taken to Establish Guidelines for Cholesterol Intake in Australia, Canada, the United Kingdom, and the United States. Bethesda, Md. : Life Sciences Research Office; 2006. 7. Jones PJH. Dietary cholesterol and the risk of cardiovascular disease in patients: A review of the Harvard Egg Study and other data. Int J Clin Prac. 2009;63(Suppl 163):1-8. 8. Schmier JK, Barraj LM, Tran NL. Single food focus dietary guidance: Lessons learned from an economic analysis of egg consumption. Cost Eff Resour Alloc. 2009;7:7.